Faced with the imminent loss of his crucial health insurance, a man unwittingly unravels a dark truth behind his insurance. 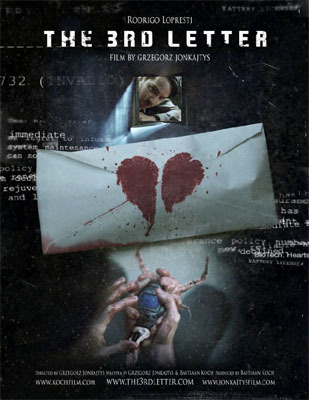 Synopsis: From award winning director/writer Grzegorz Jonkajtys ('The Ark,' Cannes Film Festival - Official Selection, SIGGRAPH 2007 - Best of Show) and producer/writer Bastiaan Koch (Visual Effects: ''Sunshine'' , ''Hellboy2'', ''Transformers2-3'' ) comes 'The 3rd Letter'. A distinctive dystopian vision where humans utterly depend on health-care plans and technology to withstand the deteriorating climate. 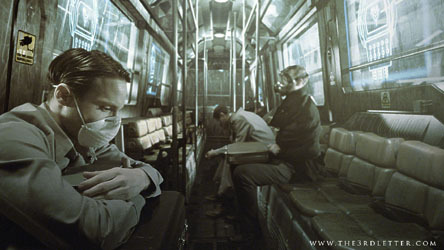 Set against a polluted, megalopolis world, the tragic tale of Jeffrey Brief (Rodrigo Lopresti) unfolds; Faced with the imminent loss of his crucial health insurance, Brief unwittingly unravels a dark truth behind his insurance. He is subsequently pushed to unspeakable lengths in an attempt for survival.